Solar energy is generated by technologies which harnesses the sun’s energy to create renewable source of power. It is a free source of energy which is sustainable, unlike fossil fuels which are limited. Solar energy does not emit any carbon gases which makes it cleaner and healthier for the environment. Worldwide revenue from solar PV installation is expected to reach approximately USD 150 billion by 2024. Revenue during the period 2014 to 2016, grew at a CAGR of 8.7%. During this period installation were highest in Asia Pacific, followed by Europe, North America, Middle East and Africa. China solely has 44% of the global solar photovoltaic (PV) capacity. In 2017, the United States, China, Japan and India are expected to generate 73% of the global PV demand. These countries are expected to dominate the solar power market in the coming decade. India is expected to reach 18.7 gigawatts capacity by 2017 surpassing Japan. For 2017, experts have identified India as being the most favoured market for growth of solar power. India is anticipated to become the third largest player in global solar market replacing Japan. Our analysts feel that the outlook for India’s solar power sector is strong. The strong, clear and transparent renewable energy policy framework which India has, provides investors the confidence to invest. It is projected that by 2040, renewable energy could generate 49% of the electricity in India. India has committed to increase the amount of electric power from clean energy resources to 40% by 2030. Under the Paris Agreement, India set a target of achieving installed capacity of a total of 175 GW of renewable energy by 2022. Out of this, 100 GW is the target set for solar power. 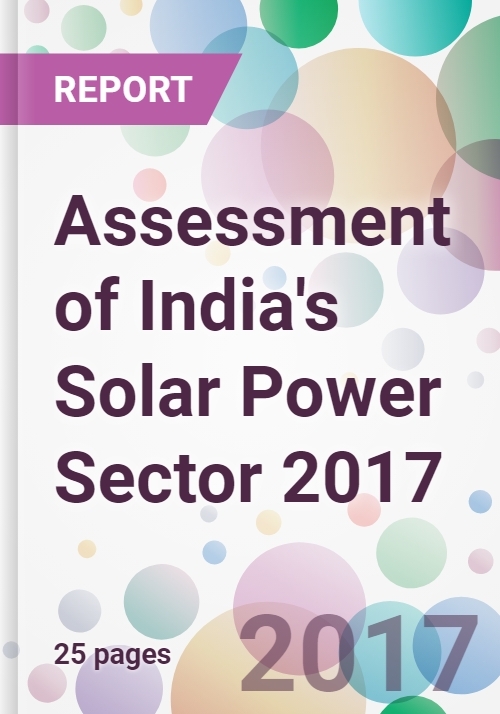 The report ‘Assessment of India's Solar Power Sector 2017’ highlights key dynamics of the global and India’s solar power market. The growing opportunity in the sector in India, along with the emerging trends have been studied. Key players in the sector including Tata Power Solar System Limited, Vikram Solar, Waaree Energies Limited, Moser Bear Solar Limited, Reliance Solar Group. The report contains latest industry leaders’ opinions. The report is available as single-site single-user license. The delivery time for the electronic version of the report is 2 business days as each copy undergoes thorough quality check and is updated with the most recent information available. The dispatch time for hard copies 4 business days, as each hard copy is custom printed for the client.